Game shows are rife with contestants who make mistakes, including pronunciation flubs, spelling flubs, guessing flubs and much, much more. Most of the time, when a contestant makes a silly mistake, he or she is momentarily flustered, but can usually rally in time for the next round. However, during last night’s episode of Wheel of Fortune, one sad SOB managed to mess up numerous puzzles, including losing a round despite having all of the letters on the board already. This all has a happy ending, however. 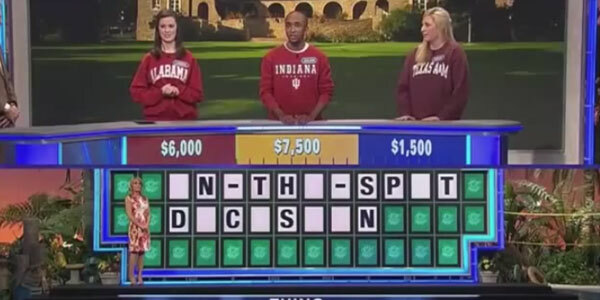 After doing damage to IU’s reputation with that t-shirt (I’m probably just embarrassed since I also attended) and flubbing numerous rounds of competition, Batts still managed to make it to the bonus round on the long-running competition show, beating the other two young women on the panel. Pat Sajak’s take on the event was a little mean-spirited but amusing, with the host noting, “I don't think anyone's ever taken a more circuitous route to victory, but the important thing is you're here.” A win is a win is a win, I guess. Of course, Batts is not the only person to ever flub a game show. We recently brought you this awkward clip of Jon Hamm totally losing during a dating game show. Or, if you want to keep the vision of Jon Hamm as a handsome and suave individual intact, you can check out this excellent compilation of ridiculous game show answers, below. And yes, I can promise it’s actually worth watching for the full 15 minutes.